Daily Log – AAA Partnership Pvt. Ltd.
Keeping handwritten daily logs is never a popular chore. Procore's construction software lets your team enter logs with the click of a mouse. It's faster and easier than old-fashioned log books. Procore's mobile apps let you enter Daily Log notes in Procore by just talking to your iPhone or Android phone. Procore's technology automatically turns your speech into text, and the notes are logged in Procore. Very cool! Procore knows construction project management practices vary between companies. That's why our Daily Log tool can be customized in moments to collect only the information you think is important. 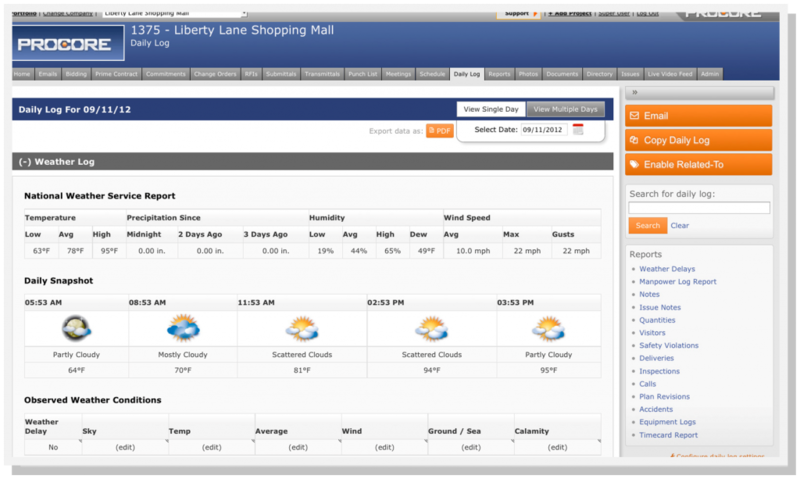 Procore's construction software is linked to a worldwide, automatic weather feed that records your project site conditions automatically. Each day's conditions are logged and can be displayed for any day in your project history.